Part I. Preparing 400 Dutch Bikes. Ov-Fiets bike. Courtesy of Dutch Railways. Vancouver 2010. To promote the Netherlands during the 2010 Olympics, as a bike-friendly country, the Netherlands General Consulate provided as a service, their public bike rental fleet near its welcome pavilion, Heineken House in Richmond, BC. OV-Fiets is the brand bike rental fleet that is provided at various Dutch Railway stations throughout the Netherlands. OV-Fiets means ‘public transport bicycle’. 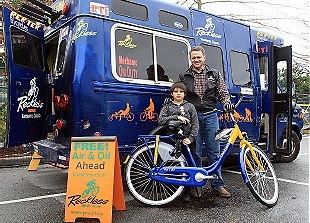 Reckless bike store owner, Paul Dragan & son Maximillian Feb. 2010. Photo by A. Bargen. In addition to Paul, enthusiastic Reckless crew members for a job well-done were: Matt Johnson, Glenn AHert, Damian Spoorer, Takesh Hatta and 8-yr. old Maximillian Dragan. They were assisted by two Dutch Railways staff members, Gerrie and Arnold. Each one-size, one-speed bike was equipped with an individually numbered frame lock and key, Schwabe 700 cc tires with full fenders plus pedal-powered front and rear lights. 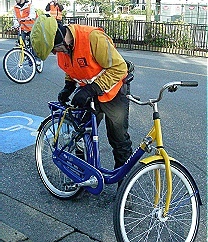 The bike frame was made in China, wheels laced and assembled in the Netherlands, while other components were from Taiwan and assembled in Sri Lanka. This bike was a global effort. This was a mighty handsome fleet of bikes for simple cycling around town. Ov-Fiets’ web site is only in Dutch. But there are more photos of the bike and the Dutch Railways’ rental scooters. Well done Paul and team! I hope you got a railway cap out of it — they looked pretty sharp! We did not get a railway hat, but we got an invite for FREE BIKE RENTALS when we go to Holland! Plus, the railway guys were super nice & invited us back once the Heinken is flowing! Muy interezante e importante el ordenamiento urbano donde la BICICLETA se le da un espacio ,el vehiculo del futuro que merece difundir la cultura del uso de la BICICLETA . Very interesting and important: urban planning in which the bicycle has a space. The vehicle of the future deserves the diffusion of a culture of bicycle use.